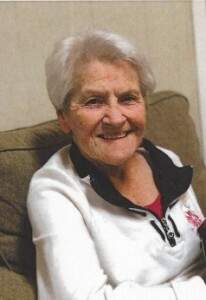 Mamie Adams Guess, age 89, of Hazen, was born April 4, 1930 to the late O.W. and Verlinda Harrison Adams. She entered her heavenly home on April 7, 2019. Mamie was a 40 plus year member of New Bethel Missionary Baptist Church of Carlisle, Arkansas. She was a waitress in Carlisle at the Capri and the Front Porch for many years, where she served many cups of coffee and loved every minute of it. Mamie, mom, “mamaw, “Memaw”, “gigi” was a wonderful mother, grandmother, and great-grandmother as well as a great example of a loving and Christian lady to her children and others. She was the glue that held this large family together and will be missed by all dearly. Mamie was preceded in death by her parents, late husband, Rex Guess, sisters, Opal Moody and Lottie Mills, brothers, Jessie, Marvin, Winford, James, and Bobby Adams, son, Ray Fisher, grandson, Scott Kelly and great-grandson, Kyler McElroy. She is survived by her four children, Yvonne (Danny) Kelly of Hazen, Debbie (Terry) Madar of Carlisle, Sandy (Johnny) Kelly of Des Arc, and Freddie (JoAnna) Fisher of Hazen; six siblings, Dorothy (late Obie) Folts of Hazen, Joe Adams (Ellen) of Sherwood, Curtis (late Nelda) Adams of Hazen, Carolyn Ferrell (Kenneth) of Hermitage, Evelyn (Jackie) Gentry of Hazen, six grandchildren, Deanna Williamson of Hazen, Kim (Josh) Simmons of Des Arc, Cody (Allen) McElroy of Hazen, Lindsey (Keaton) Thaxton of Carlisle, Cory (Lori) Fisher of Carlisle, and Cortney (Josh) Carroll of Hazen, 11 great-grandchildren, one great-great grandchild and Rachel Hester, the best caregiver we could have ever prayed for. Mamie also leaves behind a host of family and friends. Services will be held at Center Point Baptist Church North of Hazen on Wednesday, April 10, 2019 at 2:00 P.M.. Visitation will be from 5-7 p.m., Tuesday, April 9, 2019 at Westbrook Funeral Home in Hazen. Burial will be in Center Point Cemetery. Debbie, I was sorry to read about your Mom My thoughts and prayers are with you and the family. Sandy I’m so very sorry to hear about Mrs. Mamie. My mom loved her so much. My thoughts and prayers are with you and your family. May y’all find comfort in the Lords word. Debbie, I was sorry to hear about your mother. My prayers are with your family during this difficult time. Your Mom was a shining example of a loving individual and Mother. Even with my Mom’s memory loss she remembers how sweet Miss Mamie was. You Mom reminds me of the scripture at Ecclesiastes 7:1. She definitely made a good name for herself. Our sincere condolences and deep sympathy.